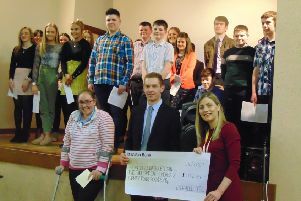 The summer of 2018 has once again been a busy, competitive and fun one for the dedicated members of Coleraine YFC. July was a busy month with members attending the Northern Ireland stock judging and silage assessment finals at the start of the month. Once again, Coleraine YFC members’ hard work paid off coming away with nine places from first to fourth. Next on the agenda saw the annual Co Londonderry Agricultural Show take place. Coleraine YFC success continued at the show when the club were awarded the YFC’s home industries cup. Members also helped steward alongside judges and assisted at the YFC stand at the show. The last Sunday of July saw the club’s first summer club outing to Tayto Park in Co Meath. It was a trip that both young and older members thoroughly enjoyed. The first weekend in August saw the return of the ever popular Coleraine Young Farmers’ Club barbecue. Yet again, the club were overwhelmed by the support of their fellow past and present young farmer members and the wider community for this event. Everyone had a very enjoyable night and thanks must go to Beatz Entertainment, everyone who came along to support and last but by no means least, to club members for their hard work and dedication to make the night a success. To round off a busy summer Coleraine YFC’s last outing took place to The Lake, Kilrea. Members enjoyed a refreshing dip in the fresh water to dust off those cobwebs, leaving them nice and clean just in time for getting stuck into the busy winter programme. Coleraine YFC’s winter programme kicked off on Monday, September 10 at the club hall on Circular Road in Coleraine.